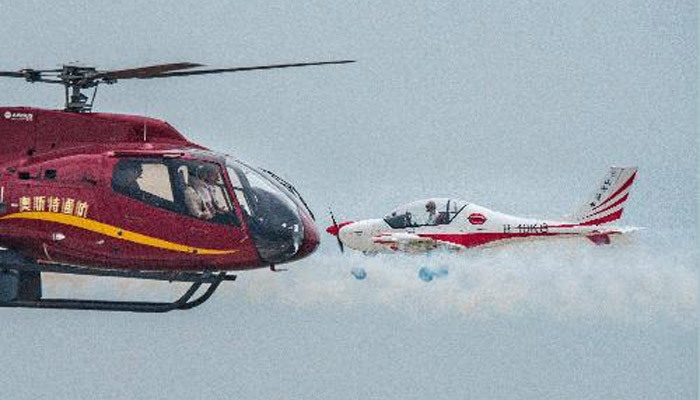 SHENYANG, China, Aug. 21, 2018 /PRNewswire/ — On August 18, the 7th Shenyang Faku AOPA (Aircraft Owners and Pilots Association of China) International Flight Convention, hosted by Shenyang Municipal Government, kicked off in Shenyang General Aviation Industrial Base and Shenyang Caihu Holiday Resort. Many excellent aviation operating units and aviation associations were invited to perform together during the conference. Nearly 100 aircraft participated in the performance, including power umbrellas, traction umbrellas, fixed-wing airplanes and helicopters, attracting more than 100,000 people from home and abroad. The static exhibition area covered 60,000 square meters, gathering more than 160 aircraft of over 60 types from home and abroad, mainly about light sport aircraft, helicopters, rotorcraft and unmanned aerial vehicles. The convention set up a broad platform for exhibitors, guests and audience to exchange expertise, conduct business negotiations, cooperate with each other. During the conference, more than 30 academicians gathered at Shenyang General Aviation Industrial Base to discuss the development of general aviation and three-dimensional transportation industry. They also explored ways to realize the transformation and application of modern scientific and technological achievements, and to construct a China general aviation characteristic town. By so far, Shenyang General Aviation Industrial Base has more than 30 aviation enterprises and 20 key projects, and 20 advanced general models from seven countries have been introduced, forming the industry chain of aircraft manufacturing and operation training, with comprehensive services of agriculture and forestry, police patrols, flight training experience, driver’s license, electric patrol, air travel, aerial survey, flight security and tests of unmanned aerial vehicle training. In the next 3-5 years, Shenyang General Aviation Industrial Base will take the general aviation industry as the support, speed up the construction of the national characteristic town of general aviation with the integrated development of livable, convenient, and convenient industries, attracting more and more domestic and overseas general aviation and uav enterprise projects. Shenyang General Aviation Industrial Base will stride forward to the grand goal of “the capital of Asian general aviation”. Be the first to comment on "Shenyang Faku International Flight Convention presented a kiss to the blue sky"